Maine recently received a major upgrade. A historic hotel, which first opened back in 1872, underwent a full transformation. The kitschy New England inn—it’s easy to picture the dusty nautical knickknacks—was gutted, modernized, and reborn. The focus is still, of course, the ocean. Seventy tiered acres sit atop Bald Head Cliff overlooking the moody Atlantic and the famous Nubble Light. But the interior is now fresh and polished. It’s a true metamorphosis. Cliff House is in Cape Neddick near the southern tip of Maine. The small residential town is part of York, the first city that the British established in North America. The sandy beaches of Ogunquit lie just to the north. While Boston is a little over an hour away—if you don’t get stuck in rush-hour traffic, that is. It makes the resort a perfect weekend getaway. The first thing you notice upon your arrival is the massive walls of windows. They’re everywhere. From the lobby, the restaurant, and the lounge, you have a panoramic view of green lawns, gray rocks, and crashing waves. There’s a huge stone fireplace in the lobby. The Gallery (inspired by the local artist colony), the Tiller Restaurant, and Bald Head Coffee Co. all sit just off the open space. Though you like what you see so far, you can’t call it love until you see your room. A striped carpet and clapboard walls await you in your coastal view king. They both extend to the private terrace, which has a view all the way to the lighthouse, at the end. The decor is both maritime and chic. Blues, grays, and whites make up the palette. Locally made comforters top the bed. Plus blue-and-white-plaid robes, which you’re welcome to wear to the spa and the pools, hang in the bathroom. You’re falling. As for that spa, it’s massive. It covers 9,000 square feet. It has a sun-filled seaside sanctuary, where blonde wood, cozy loungers, and another fireplace will make you linger over Rishi Tea long after your treatments end. It has a heated indoor pool and a hot tub. While, most importantly, it’s off-limits to kids. Now that you’ve seen the whole resort, you’re starting to form a plan. You’ll start with lunch at Nubb’s Lobster Shack since your mouth was watering for a buttery lobster roll during the drive up. 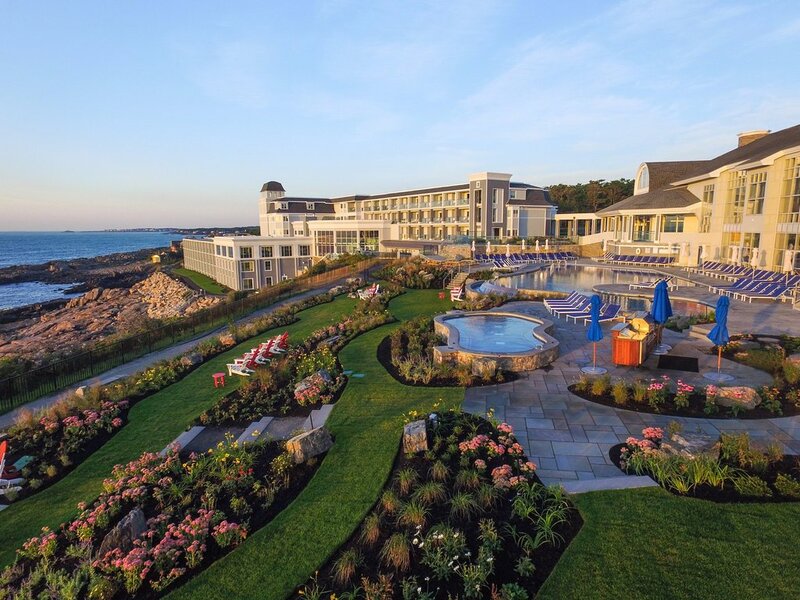 You’ll relax during your seacoast rose facial, sip green tea when it’s over, and move to the outdoor hot tub to soak up the view. After a quick shower, you’ll return to the terrace to watch the sunset with a glass of local Wiggly Bridge Small Barrel Bourbon. 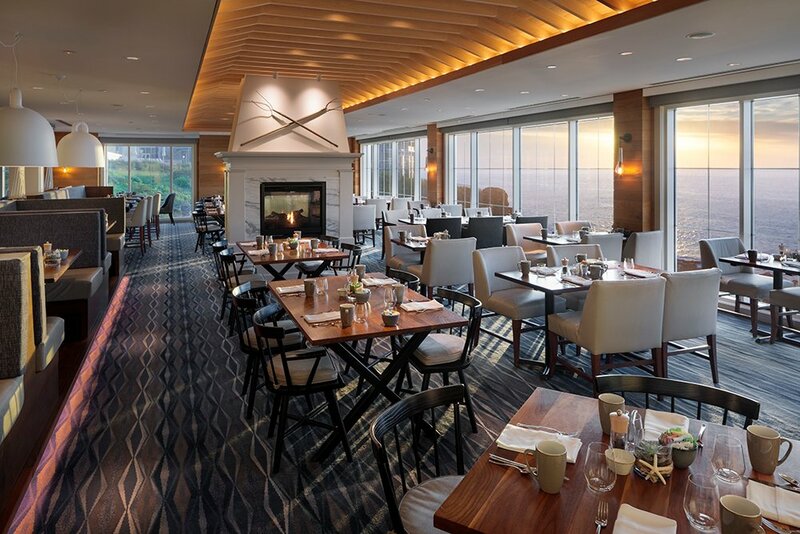 You’ll eat a seafood feast—clam chowder, Bang Island mussels, and day-boat scallops over lobster-fried rice—at the restaurant. Then you’ll head back out to the Adirondack chairs around the fire pit for dessert. Hot chocolate and s’mores are the best way to end a day along the coast. The bar has been raised in Maine.